Today I'm trying something a bit different. In my last post (8 Ways to Make a Murderer) I talked about 8 ways to build a murderer your readers will love to hate. 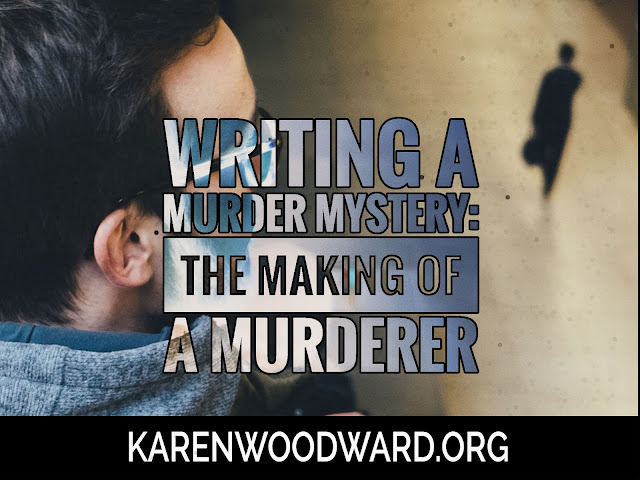 In this post I’m going to begin constructing what, arguably, is the most important character in a murder mystery: the murderer. Not only do the actions of the murderer set the story in motion, the first killing is the event that breaks the normal functioning of the ordinary world, the victim’s world. Further, the murderer’s repeated interventions keep increasing the stakes, the danger, and the suspense. Note: I've included this material in my book, How to Write a Murderously Good Mystery: The Major Characters. The antagonist—the murderer—must be a good fit for the antagonist. They are two sides of the same coin. For example, on Supernatural (I know, I know, Supernatural is NOT a murder mystery, but go with me here) the brothers, Sam and Dean Winchester, are opposites. In many ways, each is the antagonist of the other. It works well! The puzzle pieces of character, of push and pull, fit together. This sort of ‘fit’ is what I aim for with the detective and murderer. For example, Dean tends to draw sharp lines between humans and monsters. At the beginning of the TV series he thinks in terms of black and white: humans good, monsters bad. Sam, however, has a more flexible point of view since he is acquiring abilities (like telepathy and telekinesis) that only 'monsters' have. At the end of the first season the lines between hunter and monster have nicely blurred and Dean is having a bit of a crisis. The thing he loves most in life is his brother but his purpose is to hunt monsters. That clash produces a lot of (lovely!) conflict. Other examples drawn from Supernatural’s lighter side: Dean loves junk food. LOVES IT!!! Sam, on the other hand, is a bit of a fitness nut. Dean loves classic rock but Sam dislikes it. Dean loves dive bars and friendly women while Sam likes research and getting a decent nights sleep. You get the idea. And, yes, this is a different dynamic than between detective and murderer, but I think it points us in the right direction. Does one HAVE to do this sort of characterization to have a terrific story? No! Take Agatha Christie’s Peril at End House (I’m referring to the television adaptation with David Suchet). Hercule Poirot is in constant contact with the murderer, Magdala 'Nick' Buckley. I would say that the primary dynamic between detective and murderer is one of father-child, or uncle-niece. Poirot becomes a kind of mentor to Nick and sees it as his job to protect her. In the end, of course, we discover that Nick was manipulating Poirot, just as she manipulated everyone in her life! My point is that with Christie’s plots the satisfaction usually didn’t come from the complex relationships between the characters, it came from the fact that she could play (more or less) fair and still completely surprise you when it came time to reveal who the murderer was. I think this is one of the major ways in which contemporary murder mysteries differ from those of Christie’s day: now there’s more of a focus on getting to know the detective as a person. But Christie did create interesting characters! Don't believe me? Read Sparkling Cyanide. I think it’s most effective if there’s a certain amount of ‘mirroring’ between the detective and murderer. For example, if the antagonist is brilliant, the protagonist should be brilliant. (This is true for a traditional murder mystery though it might not be in other genres.) But there can be variations. The antagonist could be brilliant and the detective clever. Cleverness can beat brilliance. If you don’t believe me, watch a few episodes of Columbo! Generally speaking, if the protagonist has a difficult relationship with a sibling over a certain issue, say trust/distrust, then the protagonist often mirrors this in his relationship with another character. This other character is often the key character in the B-story. For example, if the protagonist is beginning to wonder if he can trust someone he has always had absolute faith in—his sidekick—then he might meet someone, sometime new, who seems to offer him the kind of relationship he thought he’d had with his sidekick. This situation could resolve itself in a number of ways but often something occurs in the B-story that allows the protagonist to see his sidekick in a new way. Perhaps that’s for the better, perhaps not. Since, here, we’re talking about the antagonist in a murder mystery, it could be that the protagonist, the detective, is the new person in the antagonist’s B-story. This could make the antagonist’s sidekick jealous—in the protagonist’s mind, unreasonably so but they don’t (yet) know what’s going on—and create a nice, very natural, red herring. Of course I’m not suggesting that this buddy relationship between the protagonist and antagonist would need to last more than a few pages, but it could help move the plot forward. Setting up a point of comparison between the antagonist and protagonist. You could also go the other way and have the antagonist have a wonderful, trusting, relationship with a family member while the antagonist has a twisted relationship with someone in his life and show how that difference affects the rest of their lives. For example, in Basic Instinct (again, I know, NOT a traditional murder mystery) Nick Curran, the detective, had three main relationships. One with the murderer, Catherine Tramell, one with his partner, Gus, and the third with his psychiatrist, Dr. Beth Garner. Basic Instinct is one of those movies I’ve watched over and over again because I LOVED the ending. Also, I thought it was well-plotted. Both Nick and Catherine had lost people. People they loved. And these losses had changed them. Nick was trying to reform himself, to kick cocaine, to stop drinking, and to attend therapy. Catherine, however, leaned into the trauma, the pain, the loss. She accepted it. She even seemed to revel in it. My point here is just that this shared link—both of them having suffered the loss of someone they adored—gives us a much needed point of comparison. We can compare them as people, we can compare their choices. Of course the most important comparison is between the protagonist and antagonist in respect to WHY the murderer did what he did, his motive. In the end, it will be the detective’s insight into this aspect of the antagonist’s psyche that will point her in the right direction. It is what (although she doesn’t understand it fully at first) will give her an edge. Enough preamble! Let’s create a murderer. That fits since, as we’ll see, our Lydia seeks great wealth. Musical talent isn’t something I had thought of giving the character, but I’ll keep that at the back of my mind. Why does the murderer kill? I’m going to say she kills for LOVE. Specifically, she loves her husband madly, passionately. She can’t imagine life without him. Lydia is the sort of person who would spend everything she had on a love spell. Here we’ve taken a normal, natural, wonderful emotion and twisted it by exaggerating it, by taking it to an extreme. When Lydia thinks of life without her husband (let’s call him Mark) she feels as though she’s free-falling. Sometimes she dreams she’s falling from a cliff so tall she can’t see the bottom. She reaches out to clutch at something, anything, and wakes up in a cold sweat. She realizes that for her, there is no life without him. The problem (and here I’m giving the problem from Lydia’s perspective): Although charming and capable of kindness, her husband insists on having a certain standard of living. If she can’t give that to him, he’ll find someone who can. If he knew she had run out of money then, even though he is genuinely fond of her, he would drop her like a hot potato. Murderer’s motivation: Lydia’s desire to keep her husband in her life whatever the cost. Murderer’s (specific) goal: To murder her father and brother to inherit her family’s fortune. Murderer’s (general) goal: To acquire enough money to sustain her and her husband’s lavish lifestyle. Important Note: It will turn out that LYDIA IS WRONG. She thinks that if only she can acquire a fortune that her husband won’t leave her but this isn’t true. It’s not the money, that’s NOT why her husband is slipping away from her (Lydia is correct that her husband IS slipping away). But even if she acquires a fortune he will still leave. It’s her. Her diminishing finances have put her under a great deal of stress and she’s become irritable and withdrawn. Further, there’s something about Lydia that’s immature, that never grew up. And it kinda scares him. Okay! That was a lot of information. All this more or less just came to me as I was writing, but it seems to hang together. Now let’s try to unpack the murderer’s specific goal so we can see what kind of clues we’ll need to plant. Why does Lydia have money? Where did she get it? Why is Lydia running out of money? Let’s do some brainstorming. You could do this with me and see what answers you come up with! Lydia comes from money—her father is a billionaire—but he is a firm believer in not spoiling his children. When Lydia was young her father set a trust fund up for her. It was enough that she could live comfortably—though not lavishly—on the interest. If she wanted to dip into the principle she could, though her father warned her in no uncertain terms that, barring extreme circumstances, she would get no more money from him. Lydia is out of money and so needs extreme circumstances. She racks her brain and settles on the idea of a fake kidnapping. She will need the help of another person to pull it off, but if her father received a ransom note she feels he could be persuaded to part with enough money to fund their lavish lifestyle for the rest of their lives. Lydia finds someone to help her but it goes terribly wrong and her accomplice dies. Lydia didn’t murder him (perhaps he attacked her and as she defended herself he was killed) but he wouldn’t have died if she hadn’t been trying to deceive her father. Something within Lydia snaps. She hides the body and then goes back to dispose of it. Lydia is out of money but doesn’t know anyone who could help her with a kidnapping, so that’s out. She doesn’t see any other way: if she wants the money she’ll have to kill her father and brother. The second seems more straightforward so that’s the one I’ll go with. So far so good. Now let’s go back to my previous post and see if we can answer those questions I raised yesterday. By answering these questions we’ll (hopefully) be able to discover concrete answers as well as discover what clues need to be planted. Afterward, we’ll step back and see where that leaves us and we’ll try and answer the question, or at least make inroads on the question, of what the underlying thread of similarity or contrast will be between the protagonist and antagonist. 1. Make the murderer at least as formidable as the sleuth. The sleuth can only be as impressive as the murderer so we need to create a smart, capable, powerful murderer. - How are we going to show that the murderer is smart, capable and powerful? What sort of actions or objects would demonstrate this? - What are the murderer’s most important characteristics, their tags and traits? What kind of instrument? To work as a tag it would have to be something she could carry around, so it would need to be small, something like a harmonica, recorder, flute or ucalaly. I think I’ll go with recorder. She becomes interested in various ways recorders can be made, their history, etc. Lydia likes the idea of DIY and she’s even made a few of her own recorders. It’s a hobby. Powerful: I think of a powerful person as someone who can influence the lives of others. I’m not sure this fits Lydia, though perhaps I’ve missed something. Perhaps she runs a company of some sort, one whose prospects have diminished recently. Perhaps she owns a huge beer company but the craft breweries that are sprouting up like mushrooms after a rain have cut into her sales. She knows the company will have to declare bankruptcy. She’s powerful in the sense that the fate of her employees rests with her. Of course she hates beer—can’t stand it. She’s a wine snob. How can I turn this into a tag? What represents the significance of this company to her? What represents the impact it has had on her life? Perhaps Lydia owns the company but her husband runs it. In her mind, he has run it into the ground, but she’s not being fair. The market for large commercial breweries is shrinking, there isn’t anything Mark could have done about that. This isn’t exactly a tag, but when Lydia sees beer ... part of the reason why she hates beer is because it represents the conflict between her and her husband, it exemplifies her dismal financial state. Okay! Better. At least we have a significant part of the backstory, a significant emotional element, tied to something physical (beer and a company that makes beer), something we can introduce into a scene to elicit an emotional reaction. A reaction that will demonstrate the murderer’s—Lydia’s—character. Ack!!!! I’m only at 8.1 and this post is pushing 3,000 words! Okay, I’ll stop here. I wasn’t planning on publishing a post tomorrow but I think I might try to push on with this. SO! Please do come back tomorrow as we continue to create our murderer. By the way, if you’d like to take a look at my previous post (8 Ways to Make a Murderer) and offer suggestions regarding what characteristics our murderer should have, please do! This is a really post. Thanks!